He took SAT and ACT exams for the children of wealthy parents and was paid $10,000 per test, prosecutors said. 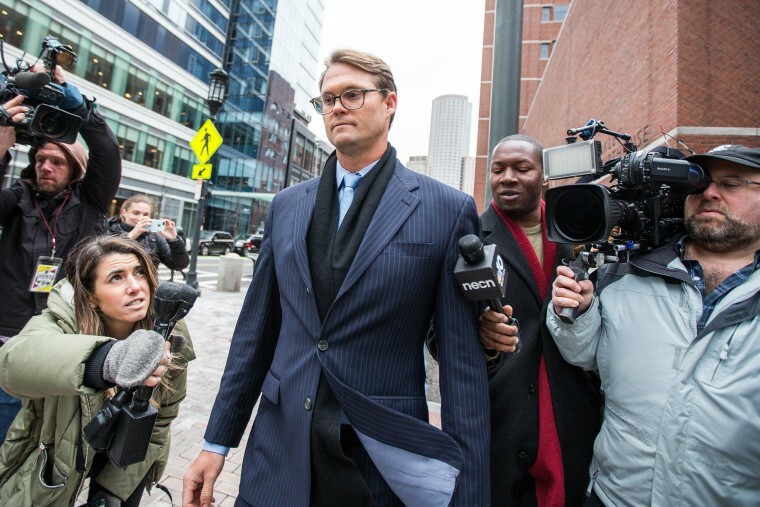 A 36-year-old Harvard alumnus pleaded guilty Friday to taking college entrance exams for the children of wealthy parents as part of an alleged $25 million college admissions scam that has led to dozens of criminal charges. Mark Riddell pleaded guilty to charges of conspiracy to commit mail fraud and honest services mail fraud, as well as conspiracy to commit money laundering. He appeared in federal court in Boston and did not make any statements before his hearing. He could face up to 41 months in prison but prosecutors have said they will likely recommend 33 months instead, according to NBC Boston. A sentencing hearing is scheduled for July 18, according to the U.S Attorney's Office for the District of Massachusetts. Riddell apologized last month for his role in the sweeping federal investigation that was dubbed Operation Varsity Blues by investigators. "I want to communicate to everyone that I am profoundly sorry for the damage I have done and grief I have caused those as a result of my needless actions," the resident of Palmetto, Florida, said in a statement released by his attorney in March. Riddell, a 2004 Harvard graduate and a four-year tennis letter winner, took SAT and ACT exams for students between 2012 and this past February, according to a criminal complaint. He was paid $10,000 per test, prosecutors said. It is unclear exactly how many tests Riddell took, but prosecutors are seeking to recover almost $450,000 in forfeiture from him. A 10-month-long FBI investigation resulted in charges filed against 50 people — including the scam's mastermind, his accomplices and the parents. Among the 33 parents who were charged were actresses Lori Loughlin and Felicity Huffman. Huffman is among 14 defendants in the scandal who is expected to plead guilty in the case, according to the Department of Justice. The former "Desperate Housewives" star admitted to paying $15,000 to get her older daughter extra time for her SAT test and to have a proctor administer the test and correct the answers. A plea hearing for Huffman is scheduled for May 21 in Boston. Loughlin and her fashion designer husband, Mossimo Giannulli, are among 16 parents facing a new indictment for their alleged involvement in the scandal, the U.S. attorney's office in Boston said Tuesday. The couple were previously charged with conspiracy to commit mail fraud for allegedly paying bribes totaling $500,000 to help their two daughters get into the University of Southern California. The new indictment adds a charge of money laundering against the couple and 14 other defendants accused in the scheme. Loughlin, best known for her role as Aunt Becky on "Full House," appeared in federal court last month and was released on a $1 million bond. Her representatives declined to comment on Tuesday's indictment. The actress was fired from the Hallmark Channel after her arrest, and her daughter, Olivia Jade, a YouTube star, lost paid partnerships with Sephora and TRESemmé.